IMPORTANT : updates are included for 1 year (there is an option for a 3 years duration). Once this delay over, the program will still work normally but if you want to update it, you will have to purchase a new license. This way, Fab's Autobackup will keep innovating and improving all the time. 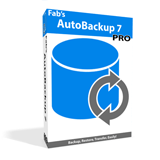 If you have purchased your Fab's AutoBackup 6 Pro license after 2017 September 17th, you can upgrade it to Fab's AutoBackup 7 Pro for free.